South Korea reported a sharp decline in the price of gasoline, diesel and liquefied petroleum gas Tuesday, as the government effectuated its temporary tax break on vehicle fuels in an effort to alleviate the people’s economic burden, data showed. According to Opinet, the oil information platform run by the Korea National Oil Corporation, the average per liter price of gasoline here stood at 1,677.39 won ($1.49) at around 2:30 p.m. on Tuesday, down 12.91 won from a day earlier and marking the lowest figure since 1,684 won on Oct. 14. 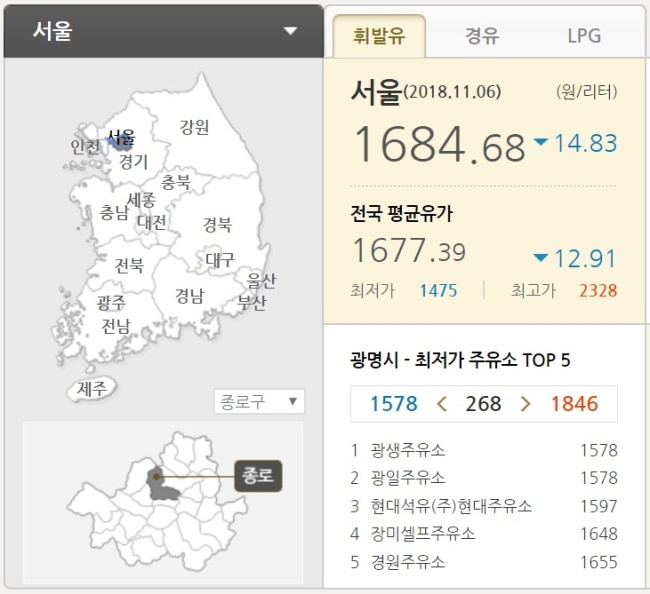 The regional average for Seoul, where fuel prices are conventionally the highest nationwide, was 1,684.68 won, down 14.83 won from the previous day. 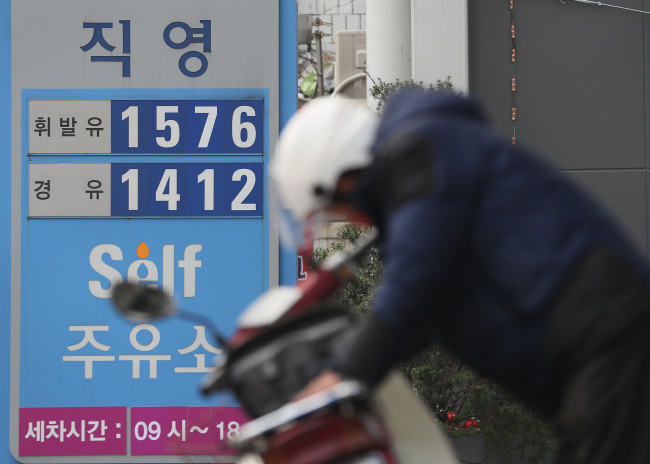 Some gas stations even lowered prices to the 1,500 won range during the morning. Average prices for diesel and LPG came down to 1,481.21 won and 915.23 won, respectively, down 14.55 won and 19.1 won from the previous day. The visible markdown took place in step with the government’s temporary tax cut on vehicle fuels, which is to run for six months starting Tuesday. “(The government) will alleviate the people’s (financial) burden by some 2 trillion won by lowering fuel tax by 15 percent,” Deputy Prime Minister and Finance Minister Kim Dong-yeon had said in a meeting of economy-related ministers late last month. The fiscal policymaker’s remark, which led to the first fuel tax cut in 10 years, came as part of the government’s continued efforts to support households and small-sized businesses and to revitalize the nation’s struggling job market. “(The fuel tax cut) is a policy that may only take effect under favorable tax revenue situations,” Kim also said in a separate parliamentary audit session, reiterating the need of the temporary tax measure and dismissing the concerns on the government’s financial burden. It is uncertain whether the government will prolong the tax cut plan in May next year, the minister also said, citing changes in economic situations. Though the tax cut took effect at midnight, gas stations may choose to implement the renewed tax rate at different times, considering their conventional inventory. The price of gasoline ranged from 1,385 won to 2,323 won as of Tuesday morning, data showed. Meanwhile, Opinet experienced a sporadic connection failure throughout the day as vehicle owners rushed to the website to check out the best budget station nearby.